Worn at many formal daytime occasions, often at weddings, also races, garden parties, investitures. Royal Ascot Black or grey obligatory, hats are required. See the ascot.co.uk website for full details, which varies according to the enclosure. Suits are available to hire in sizes from 20" - 60" chest, and 18" - 54" waist. For traditional weddings, traditional is best - that means morning suits. There are variations such as frockcoats and tailcoats, the Prince Edward style is less formal. The groom, best man, bride's father and ushers is the absolute minimum. The groom's father and brothers of both the bride and groom also usually wear morning suits. 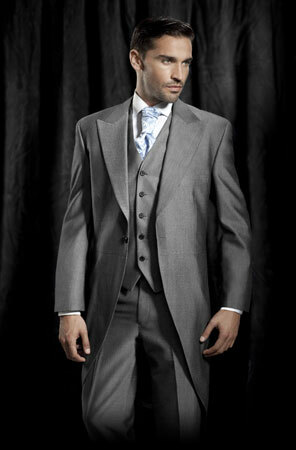 Often grooms choose a tie and waistcoat to match the bridal colours. We have a wide range available, or can make up accessories in your own fabric if required.